Great time best Christmas gift ever! I would highly recommend this biplane ride for anyone who is looking for a great gift idea. My sister-in-law and I are interested in the thirty minute, $299.00 ride above Philadelphia from the Northeast Airport. The time of the day does not matter to us. I am now reading Stephen Coonts' book about the Cannibal Queen. I noticed in your customer photos that the picture of the queen is no longer R rated! I am looking forward to hearing from you and then taking a biplane ride on the Queen. Our children gave us a gift certificate for one of your bi-plane rides. An excellent gift! I called the 800 number but your mailbox was full. You must be doing great business! 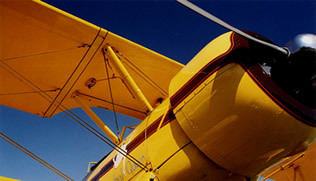 I am interested in a two person biplane ride for myself and my daughter. Two questions; How do I book a time? Can you tell me availability? I wanted to tell you that it was worth the wait to get a ride on the Cannibal Queen. I also want to thank you for putting the photos on the website so quickly. I especially like the ones with the goggles, also known as the giant insect pictures. My own pictures, the 35mm ones, turned out really well. The ones straight down at the battleship New Jersey, the Art Museum, and the Adventure Aquarium were really clear. It was wonderful to see the Philadelphia sights from another angle. No wonder you love flying and love the Queen! Thanks again and wishes for many, many happy hours of flight. I flew with you once in the spring of 2004 and really enjoyed it. I saw you fly over my house in Beach Haven West on Sunday afternoon. I will be at the shore this weekend. I understand that you are fully booked but if you get a cancellation, please call me. I am looking to schedule a biplane ride on Sunday for my father’s birthday gift. I think a biplane ride will be the perfect gift! Thanks again for yesterday. It was one of those experiences that you hope--when you finally get to do it after all the daydreaming--is exactly what you wanted it to be. Don't be shy. If there's anything I can do from washing the Queen to serving as a media contact or something, let me know. I think what you do--keeping history alive and providing people with a unique experience--is a damn worthy calling in life. Stearman planes and talking with him about it really got him excited. My other grandfather, who also was in the south pacific, was going to go up with me in lieu of my cousin but he was a little nervous so I came myself. I was thinking of booking a biplane ride (specifically the Beachcomber 30 minute ride), in New Jersey (preferably near Long Beach Island). I was wondering what times you fly and where do we meet? Please let me know. Thank you again for giving us the chance of a lifetime- we had a blast! I had no trouble at all navigating to the customer photos. I am interested in getting one of the biplane rides as a gift for someone and would like to know when the best time to call to set up the date would be. I can't think of a better gift! I have a gift certificate for a biplane ride that I would like to use at LBI. Please contact me to schedule. I can't wait! I have a biplane ride gift certificate I would like to use. Do you have an open slot for this Sunday? Hi - I was hoping you could answer a few questions for me, I am interested in purchasing a 1/2 hr. biplane ride. I guess that should get me started - Thank you in advance.